According to reports in various newspapers (such as the Guardian in the UK), legal experts in China are proposing that a new law to prevent the abuse of animals should include a ban on the consumption of cats and dogs. 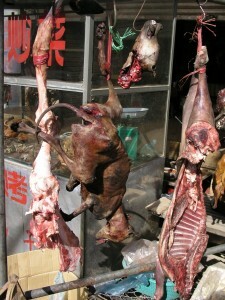 As anyone who lives in China knows, eating these animals is rather unusual, and generally limited to a few regions. Moreover, eating dog meat, though it dates back to ancient times, is a seasonal delicacy, suitable only for very cold weather because of its heating qualities. Looking at Western discussions of Chinese food, however, you’d never know that it was a minority pursuit. Westerners, as I argued in this op-ed piece in the New York Times a couple of years ago, have been obsessed with Chinese dog-eating since the time of Marco Polo. It’s something they just love to get outraged about. Personally, I’ve never understood how people can be horrified at the idea of eating dogs, while happily eating pigs (which are also intelligent creatures). Both are equally gruesome, when you really think about it. So why are the Chinese thinking about a ban? Is it really the result of the increase in numbers of people who keep dogs as pets, and can’t bear the thought of them? Or of concern about the role of the dog trade in ‘causing social problems’, as one lawyer quoted by the Guardian alleges. And if it’s partly about disquiet at the maltreatment of farmed dogs, have the campaigners ever seen what happens in a factory farm producing beef or pork? The other explanation, of course, is that the Chinese are growing increasingly sensitive to Western pressure on the subject. If Westerners think dog-eating is barbaric, is it time to ditch it? I am a vegetarian, though I used to eat and enjoy meat, finding out about how animals were treated in factory farms took all they enjoyment out of eating meat for me. And then I got my first pet rabbit, and people around the world seemed to “re-discover” this wonderful meat, and I felt sick at the thought of people eating these sensitive, gentle and emotional creatures. Yup – no different to eating a dog. Now the Cantonese is going riot..
I’ll be very surprised if this proposal is ever passed. Dog eating is an ingrained part of the culture here in Guangxi. A recent survey had 53% against the proposals, with only 31% in favour. I agree with you Fuchsia. There is no moral difference between eating dog and eating any other animal. Any complaints are purely emotional. There has, however, been some concern here about the hygiene standards on dog farms. They are still mostly small, underfunded, low technology peasant operations. The answer to that would seem to be to clean them up rather than just ban them. That would surely just drive the trade underground making health issues even more difficult to monitor and control. The same debate flares up here in New Zealand periodically. Dog meat appears to be a Tongan delicacy (http://www.stuff.co.nz/national/2768167/In-defence-of-dog-eating). Given there have been several horrific attacks on children by dogs this summer I am heartily in favour of anyone wanting to barbecue their pit bulls and rottweilers!! Maybe they should first care about human rights or Tibet. There is also a lot of pressure from the west. The dog thing is just overrated. I agree, people of China now see how the west views them, I was back there in the 80’s and back then, American cigarettes and jeans was the choice of the young generaton. I have heard of my dad growing up in China and he can remember when his dad and uncles killing the family pet, he would stay away from home for days. It would take great famine for me to even think of eating a dog or cat. Jody: Not only you have heard about this but many other overseas borned chinese. With my parents they had no choice back in the day because they were poor. You should understand. The west have globalised the world but failed to globalise themselves. They should read up on the book clash of the civilisations, as it would educate them more living in a planet with other human races..even though many of them would choose to be ignorant of other countries culture and religion anywayz… We are all victims of westernisation. The west seems to have monopolised on correcting what is right or wrong. I really feel sorry for “jook sings”. I also fail to understand why you can eat beef, pork goat and horse but not dog. Vegetarians should wake up to the fact that eating cheese, yoghurt etc. kills cows as well. Vegans I can understand, eating little meat is good, vegetarians to incosistent for me. Much of the objection to dog meat consumption concerns how the dogs are slaughtered. Yes, pig/cow/chicken slaughter in the US is pretty awful but surely you must know, Fucshia, that some Chs consumers of dog meat believe the meat to be more tender and ‘invigorating’ (to men) if the animal has suffered before death and thus released a lot of adrenilene. There are by now a fair number of substantiated reports, with photographs (and video), showing dogs being knocked over the head but not killed before being sliced up. Or held by head and tail, throat cut, and left to bleed out slowly as they kick in agony. There are reports of dogs being drenched with boiling water right before slaughter, or having their legs broken and left overnight before slaughter, or having holes cut out of their paws and being left to bleed overnight. All in the name of more tender, tastier meat. I’d never eat dog but I do agree that it’s hard to argue for killing a pig for food but not a dog; I totally see the lack of logic in a blanket ‘Chinese shouldn’t eat dog’ sort of statement. But I think we can all agree that purposefully causing an animal to suffer before slaughter just so the meat is more tender or more likely to help you in the bedroom is, I’m sorry – barbaric. There really should be no cultural relativity when it comes to inflicting excessive pain on purpose. There are animal rights groups that recognize the right of Chinese to eat dog, but are campaigning to end these practices. I don’t see anything culturally imperialistic about that. BTW — dog meat is all over Chongqing, a fairly populous city by any standards, at this time of the year. Not all Chinese eat dog meat, but it’s not a tiny minority either. regarding Michael Zehrer post on 28th Jan, his comment about the human right in Tibet, does he know anything about Tibet, or he just get it from CNN, or westernised news. We should stick with culture and food here…. The difference is, pigs etc are reared to be eaten, which is not nice to say. As a meat lover, I try to buy good quality meat from good sources, and buy free-range/organic whenever I can. Dogs eaten in China were not reared. Lots of them were kidnapped to be eaten. (OK you may argue that game meat is wild, however most game meat is still farmed to some extent.) In my parents’ estate, several neighbours lost their pet dogs because some labour workers from the rural took them. In the old days when there aren’t much food around, people were desperate to find meat. My father told me when he was 17, working as Zhi Qing in the countryside that the gang of them once ate a dog because they were so hungry. But time chage, so should the society. Some dog-eaters claim that it’s Chinese medicine for arthritis. I think it’s just an excuse. The bottom line is animal cruelty. In the day and age when we are champaigning against battery-chicken, why should there be dogs kidnapped and eaten? The same goes to bear farming, not sure if you’ve seen it, it’s disgraceful. I believe you need to respect what you eat, do the meat justice for the poor animal that died for the meal. Dog eaters don’t respect life.